Epson’s Stylus Photo R1900 uses pigment inks to produce long-lasting, borderless photographic prints at sizes up to 13 by 19 inches. At $549, it’s one of the lowest-priced pigment printers available, but if you love the look of glossy photos, you’ll find that there’s no better printer on the market right now. The R1900 uses seven inks--photo black, matte black, cyan, magenta, yellow, red, and orange. An eighth cartridge contains a special spray called a gloss optimizer, which is laid down on top of a glossy print to minimize a condition called gloss differential (also known as bronzing). If you look at a glossy print from an angle, the light will reflect differently on areas where there is little ink than it will on areas of full ink coverage. Depending upon the printer, this effect can be quite distracting, and Epson eliminates the problem by letting you opt to cover the entire print with the gloss optimizer spray. The R1900 is a large unit, although it folds up fairly compactly when not in use. It has two top-loading paper trays: one for standard-thickness photo paper, and one for single sheets of thicker fine-art papers. It also comes with hardware for connecting rolls of photo paper up to 13 inches wide, and a tray for printing on CDs and DVDs. Getting the printer up and running is easy; the eight ink cartridges snap into place, and the included CD installs a printer driver and Epson’s Print CD software. The R1900 has two stand-alone USB ports on the back, designed to let you connect two Macs (a desktop and a portable, for instance) simultaneously. For years, if you wanted the best possible glossy prints, you had to purchase a dye-based printer. The R1900 changes all that. On Epson’s Premium Glossy and Premium Luster papers, images pop off the page in a way that we haven’t seen from any printer priced under $1,000. Even when we put prints from the R1900 alongside prints from the best dye printers on the market‚ Epson’s Stylus Photo 1400 ( ) and Canon’s Pixma Pro9000 ($500), viewers unanimously chose the R1900 photos as the best. With the gloss optimizer, R1900 photos have the continuous-tone look of traditional photo lab prints. While we expected the R1900 to do well with glossy photos, we were equally impressed with the printer’s output on matte-finish and fine-art papers. Photos printed on Epson’s Premium Presentation Matte, UltraSmooth Fine Art, Velvet Fine Art, and Watercolor Radiant White were rich and vibrant, with excellent shadow detail and a broad tonal range. 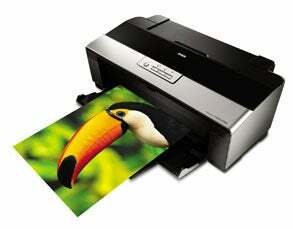 One reason to invest in a pigment printer is that it can produce a long-lasting archival print. According to the print-permanence firm Wilhelm Imaging Research, prints from the R1900 should last anywhere from 85 to 200 years, depending upon the paper type. If you’re looking for a printer optimized for black-and-white printing, however, look beyond the R1900. Unlike the more expensive Stylus Photo R2400 ($800), the R1900 doesn’t have additional light black inks, and must use all of its existing inks to create a composite grayscale print. The result is less than ideal for anyone who has exacting standards, although we think most users who want to occasionally print in black and white will think that the R1900 does a fine job. Most people choosing a printer in this price range are concerned about photo quality, but print speed can also be a factor, and here the R1900 is also a winner. Using the default print mode, the R1900 printed a 4-by-6-inch photo in 36 seconds, an 8-by-10-inch photo in 76 seconds, and a 12-by-18-inch photo in 157 seconds. These times were half those of its direct competitor, HP’s Photosmart Pro B8850 ( ), and nearly as fast as Canon’s Pixma Pro9000. When printing at the maximum resolution setting, the R1900 took roughly twice the time to print, but its performance in relation to the Canon and HP printers was nearly identical. We don’t think that many people will ever need the R1900’s CD-printing capabilities, but they’re easy to use and produce great results on printable discs with a matte finish. As we’ve noted in the past, the Print CD software is serviceable, but if you plan to print on a lot of discs, you’re better off with a third-party program, like DiscLabel from Smile On My Mac. One of the knocks‚ rightly or wrongly‚ on Epson’s printers has been that they clog with more frequency than those from Canon or HP. With the R1900, Epson has added a few things to help minimize the potential for clogging, including a special ink-repelling coating on the printhead, glass beads inside the ink cartridges to keep the ink stirred up, and a mist-collection system to reduce the amount of ink spray in the printer. It’s hard to test the effectiveness of these types of things, especially in a new unit, but we’re glad to see Epson taking some positive steps here. Epson has done an excellent job with the Stylus Photo R1900, creating a printer that produces the best glossy photos we’ve seen in this price range. It also does a great job on matte and fine-art papers, and is quite speedy as well, making it an ideal entry point for someone looking to get into archival, pigment-based photo printing.